Choosing the best VPN app for Android can be tricky; with so many options, it’s hard figuring out which ones are the best, and which you can trust. Explore the marketplace with us, as we discover the best VPNs available in Google Play Store. What makes a good Android VPN? Not all Android VPN apps are made equal, and there are several factors you need to look for when browsing the VPN marketplace. These factors are brand, price, security, jurisdiction, ease of use, speed, and reviews. This article first lists all five best Android VPNs, and then explain the criteria that we used to make this list. What are best VPN services for Android? This is the perfect free VPN Android app if you want to dip your toes into using one. It’s not super cost-effective or the best performer, but you can be confident that unlike other free services, this VPN will protect your data. Plus the bear-themed service is fun. Simple system and easy to use. Free 500MB for beginners who want to see if VPN for Android is right for them. Has a killswitch available for all plans to prevent your connection being compromised. Only two different plans to choose from compared to other options on the market. Does not unblock Netflix. 1-year contract at $4.99 per month. 1-month subscription at $9.99 per month. 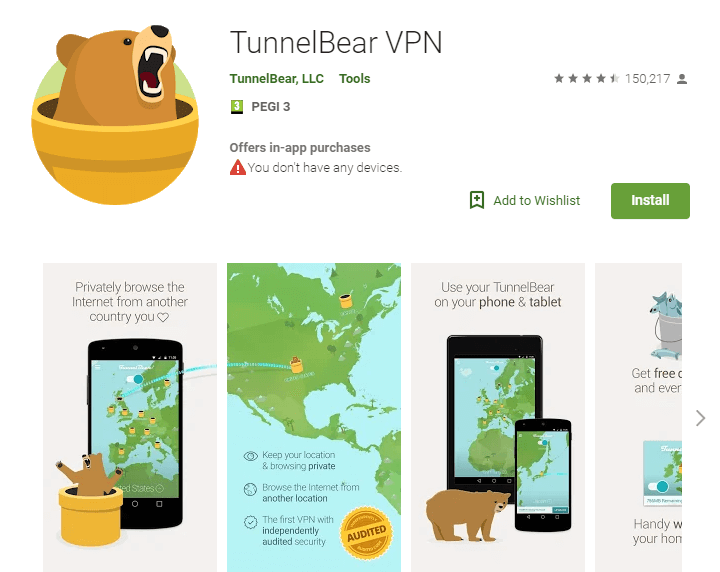 TunnelBear has a 4.5 rating on the Google Play store with over 150,000 user reviews. 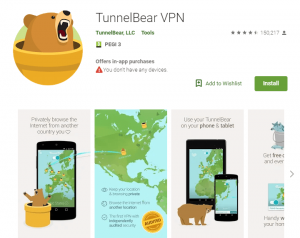 Out of our list, TunnelBear has the highest user ratings (probably due to its free plan). 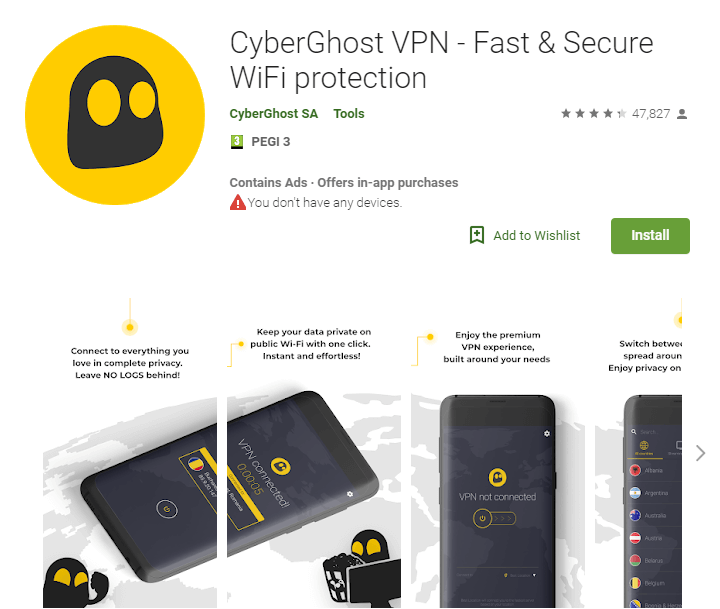 Affordable and highly ranked; if you aren’t worried about speed and just want to protect yourself, this CyberGhost VPN for Android is a solid choice. In fact, 20 million other users agree that CyberGhost is a solid product. A great budget option if you want the benefits of a paid VPN without choosing a free service. Recommends the best server depending on your location to ensure an optimum experience. Streaming services like Netflix are unblocked. Free trial available. Average speed, they don’t have thousands of servers at their disposal and it shows in their connections. 3-year contract at a very cheap $2.75 per month. 2-year contract at $3.50 per month. 1-year contract at $6.49 per month. 1-month subscription at $12.99 per month. CyberGhost has a 4.3 rating on the Google Play store with over 47,000 user reviews. The fastest VPN app on the Android marketplace but missing those extra features that you expect from top-performing VPNs. 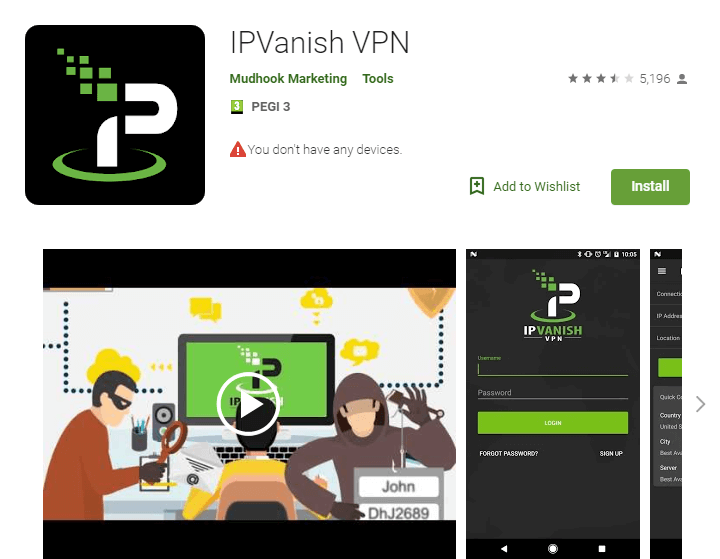 IPVanish is the fastest service available on the Android VPN market. No logging, guaranteeing anonymity (although there is some history… read our review to find out). Unlimited bandwidth for all your streaming and torrenting needs. 256-Bit encryption to keep internet activity safe. No free trial; you have to commit to one month to try out the service. You can ask for your money back in 7 days, though. No kill-switch to protect your connection if it is compromised. 3-month contract at $8.99 per month. 10month subscription at $10 per month. IPVanish has the lowest ranking on this list, with a rating of 3.5 on the Google Play Store. A great VPN for Android that combines high-quality encryption with fantastic speeds. Just a tad more expensive than other options on the market, but if you want the very best that hits every checkbox, then this is the one for you. Fantastic, responsive live chat support too. Well-designed app for Android OS that’s simple to use. All streaming platforms unlocked. Very fast, with over 2,000 servers across the globe. You can easily change which server to connect to. Extra-strong security with 256-bit encryption – this is one of the most secure VPNs on the market. Zero logs. Maximum of 3 simultaneous connections (but you can set up your router so your entire network is covered). It is also one of the more expensive options on the marketplace but a longer subscription makes it affordable. 15-month subscription at $6.67 per month. 6-month subscription at $9.99 per month. 1-month subscription at $12.95 per month. 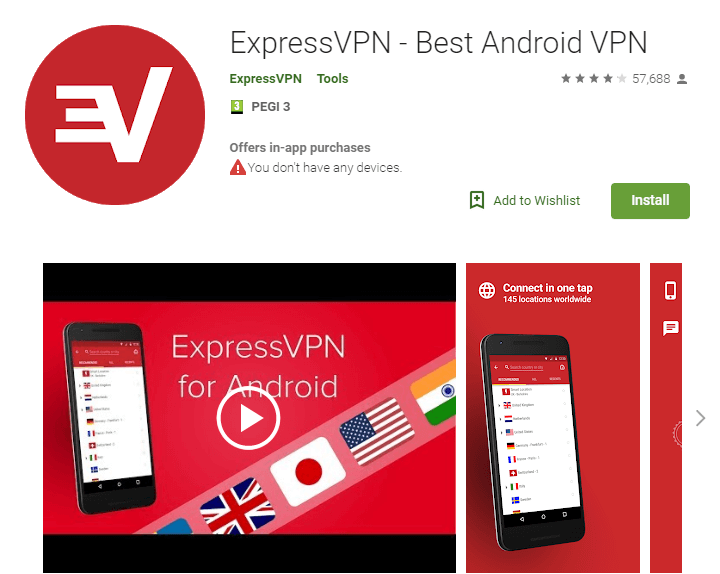 ExpressVPN has a 4.1 rating on the Google Play store with over 10 million installations. The best overall VPN Android app on the market, and a solid choice as your number one preference. We love the double VPN feature, something that most other apps lack. The company is based in Panama and away from any snooping government eyes. Double VPN. Surprisingly, NordVPN passes their VPN through an additional VPN, so you have double the protection (we heard you like VPNs in your VPNs, so we put a VPN in your VPN…). Excellent ease of use. We found this VPN to be the simplest to set up and deploy. NordVPN is also very fast, we were able to browse and download and barely noticed the speed difference. They have almost 5,000 servers – that’s plenty of choices! NordVPN also has built-in malware and adblocking, so your information not going to advertisers. They have special servers to stream (such as Netflix). Their android app is more limited than their desktop app, particularly when it comes to reconnection settings. 36-month subscription at $2.99 per month. 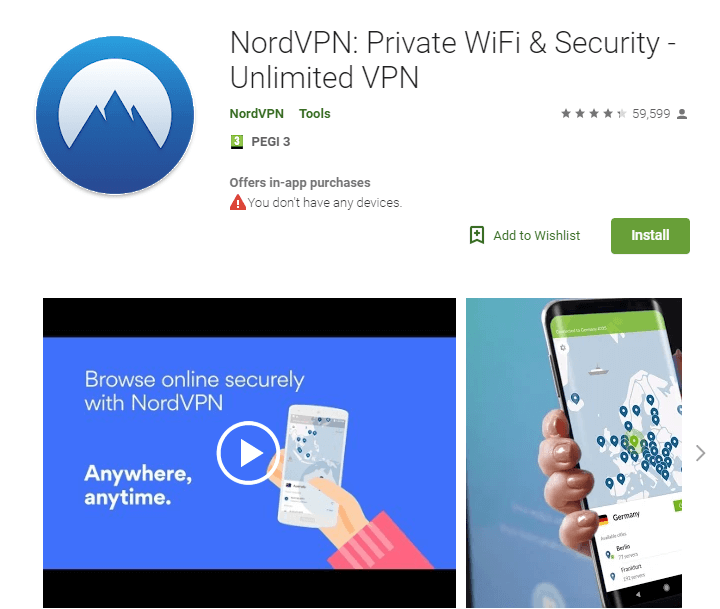 NordVPN has a 4.3 rating on the Google Play store with over 5 million downloads. Brand: What brand is reliable? Choosing a good VPN often depends on whether you should go with a brand that’s established with a history of performance & security (a trustworthy track record), or to go with a startup that typically offers shiny new features to better safeguard your Android device. A well-established company will also most likely provide more servers and better infrastructure for optimum speeds. As there are many free VPN apps for Android out on the market, why should you pay for one? There are several disadvantages and things to watch out for considering free VPN networks. 18 percent do not encrypt any of its users’ traffic. Price should be a factor when choosing a paid VPN for Android, as you want the best bang for your buck, but we’d never recommend a free service that can compromise you. Remember, you get what you pay for and if you’re paying nothing, it’s because YOU are the product. Security: How safe is your connection? How does the VPN for Android service protect your data? Not all VPN encryptions are equal with many having different levels of encryption. The standard level is 128-bit encryption, but some offer a preferred 256-bit encryption – top-tier protection that even the authorities and billion dollar companies use. Jurisdiction: Where is the company located? Jurisdiction is where the VPN servers and businesses are located. For example, the VPN server might be in the US, making your Android device appear on a US network. A VPN server might be located somewhere more neutral, like Switzerland which has a much more lenient view on data protection laws. Any VPN service worth your time should have an array of servers around the world, allowing you to pick and choose your preferred jurisdiction. In regards to the business itself – no matter where the servers are, if the business itself falls under any of the 5/9/14 Eyes Alliance jurisdiction, then your identity may be at risk. This is important because, in some jurisdictions, the government may secretly mandate that the VPN service must keep logs. Keep in mind how susceptible a VPN company might be to information warrants. Does the VPN keep any information that can be traced to users? In case you are doing anything illegal such as downloading copyrighted material, your identity may be at risk. It’s best to avoid sticky situations such as this by avoiding any surveillance-heavy jurisdictions. Ease of Use: What features does the Android app have? Is the VPN app easy to install and use? Is setting up the IP address forwarding difficult? What about access to streaming services? Kill switches – the ability to instantly and automatically cut all your Internet connection if the VPN connection is dropped). IP leak prevention – a good VPN will have protection from leaking your IP to anyone. The IP is your identity and certain apps and/or websites may be tracking this information when you access them. Speed: Which is the fastest VPN on Android? In terms of checking for speed, it really does depend on where you are located in the world, your base connection speed, and your phone itself. Through our tests, we found IPVanish to be the fastest from the list (although, not by much). But with no free trial, this can be a tedious test to conduct yourself. Before choosing any of the Android VPN apps above, be sure to test their free trial to see if it works for you, provided that they have one (such as the free three-day trial provided by NordVPN). Reviews: Do other people recommend the VPN provider & their Android app? We also need to have a good look at the current reviews for each VPN app in the Google Play store. Do many people recommend the app itself? Or are there complaints and reviews that suggest buying this service is unwise? To give it a go, we recommend using a free trial as they’ll provide the same level of service (though a little slower than their paid versions) but your data will be just as secure. Still curious as to what a VPN is and why you need one? Keep reading. A VPN is a Virtual Private Network. Essentially it allows you to encrypt & reroute your internet through another network, hiding your online activity. It can protect your data from prying eyes, such as your internet service provider and 3rd party trackers. A VPN will also allow you to “appear” to be in another location to beat geo-restrictions (e.g. – access Netflix content not available in your country). Your data is encrypted between your Android device and the VPN service, regardless of whether you’re on a cellular connection or WiFi. The destination website sees your VPN server as the traffic origin, not your Android device (provided that there are no leaks). No one can see what you’re browsing or accessing on the Internet when using a VPN, unless the VPN service is watching and logging your activity, but more on that below. When browsing the Internet on your Android device you’d be mistaken in assuming you’re untraceable and your sessions private. Unfortunately, cellular networks (such as 4G or 5G) and public WiFi networks make you vulnerable to man-in-the-middle attacks, putting you at risk and exposing your data to 3rd parties for easy logging & alterations. Thanks to new copyright laws passed in recent years, many countries (such as countries in the US, EU, Australia, Canada, etc) now request that internet service providers monitor their networks for copyrighted material. This means any sort of torrenting or peer-to-peer applications are tracked closely. They are also piggybacking off this law, introducing new mandatory data policies to keep a record of all your online activity – essentially logging additional data. This can be concerning in countries that are notorious for censorship, or places that don’t take criticisms of the government lightly. In some places, even stumbling accidentally onto an article exposing government corruption can lead to jail time. Some governments outright ban the use of VPNs. These countries include China, Turkey, Iraq, United Arab Emirates, Belarus, Oman, Russia, Iran, North Korea, and Turkmenistan. If you are in these territories, a VPN is dangerously necessary (though we’d advise you take caution reading this). It’s not just the government you need to watch out for. Many corporations track your online activity and what you look at online. This might seem harmless, but this data is then sold to third parties who deliver targeted advertising. Business owners also need to watch out as confidential communication could be leaked to the competition or malicious 3rd parties. Many large organizations insist on using a VPN or similar security for remote work and mobile devices as a default security measure, before team members can connect to their networks. If you want to protect yourself and your data, a VPN is a great safety measure and luckily some VPN providers support a wide range of Android devices (from earlier software versions to the latest, and include both tablet & mobile devices). In addition to the positives that come with added data security, a VPN allows you to access restricted content anywhere in the world. For example, Netflix manages its vast catalog of content differently depending on what country you are in, with more availability in some regions than others. With these protections and advantages, it just makes sense to have a VPN for your Android device if you are considering it.